Volkswagen just unveiled a new car at the Qatar Motor Show that gets an astounding 100km for less than a lieter of diesel fuel – that’s the equivalent of 313 miles per gallon! The green car is an upgraded version of the VW L1 vehicle and it features an ultra-efficient diesel engine in addition to an electric motor that is powered by a lithium-ion battery. The concept car’s two-cylinder diesel engine is capable of working in two modes: eco and sport. While in the eco mode, the car’s engine will run at 27 hp/4,000 rpm, however in the sport mode this figure increases to 39 hp. While in this mode, the car will be able to reach a top speed of about 160 km/h, or 99 miles per hour. The VW is made from carbon fibre-reinforced plastics, which saves on metal and makes the car incredibly light, aiding its reduced fuel consumption. Fully fueled, the VW weighs only 380kg (838 pounds). 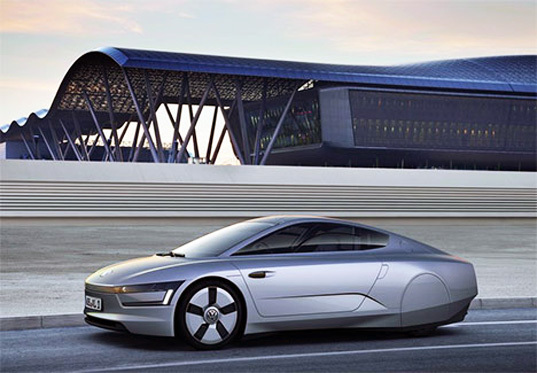 While the car’s fuel efficiency is certainly impressive, it is actually not the first time that Volkswagen have released such a car – they also unveiled an ultra-efficient auto at the 2008 Frankfurt Motor Show. However the L1 actually had an average fuel consumption of 1.38 l/100km. 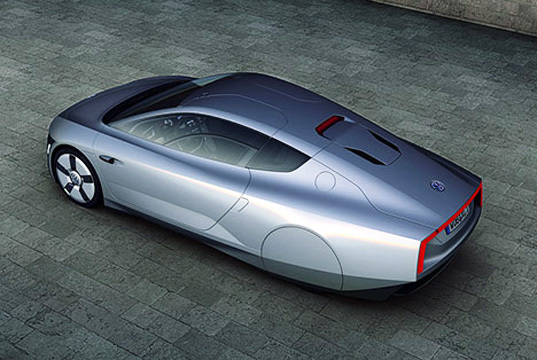 The new XL1 concept car is slated to enter production in 2013 and is expected to cost approximately $29,500. Although not a completely clean transportation solution, hyper-miling vehicles feature lightweight bodies and ultra-efficient engines that are able to run on a single gallon of gas for great distances while producing much less emissions. Volkswagen just unveiled a new car at the Qatar Motor Show that gets an astounding 100km for less than a lieter of diesel fuel - that's the equivalent of 313 miles per gallon! The green car is an upgraded version of the VW L1 vehicle and it features an ultra-efficient diesel engine in addition to an electric motor that is powered by a lithium-ion battery.